BOSTON - Thursday, May 4, 2017 - Mayor Martin J. Walsh today joined Boston Fire Commissioner Joseph Finn, firefighters, students from the Mather Elementary School and community members in proclaiming Thursday, May 4 as "Firefighter Appreciation Day" in the City of Boston, which honors the important contributions and sacrifices that firefighters make to keep Boston safe. As part of Mayor Walsh's recently released Fiscal Year 2018 - Fiscal Year 2022 Imagine Boston Capital Plan, the City will invest $71 million in state-of-the-art technology and equipment for the Boston Fire Department over the next five years to improve the fire protection and emergency services that are vital to neighborhood safety and security. "The members of the Boston Fire Department are real-life heroes who work hard each and every day to keep people safe in our City," said Mayor Walsh. "I am proud to proclaim today as Firefighter Appreciation Day in the City of Boston, celebrating the service and sacrifice that the men and women of the Fire Department make to protect our City. Those who put their lives on the line everyday to protect our residents deserve to have the best equipment and services, which is why we will continue to invest in cutting edge technology and equipment for the Boston Fire Department." As part of today's event, Father Daniel Mahoney, Chief Chaplain for the Boston Fire Department, blessed Engine 16, the first of 23 new engines that will be added to the department's fleet over the next several months. In addition, the Capital Plan sets aside funding for new fire stations that will reflect the best practices for firehouse design that were studied by the Boston Fire Department and the City's Public Facilities Department. Key changes include separating out different areas of the firehouse to keep fire contaminants away from living areas and improved personal and gear cleaning facilities. 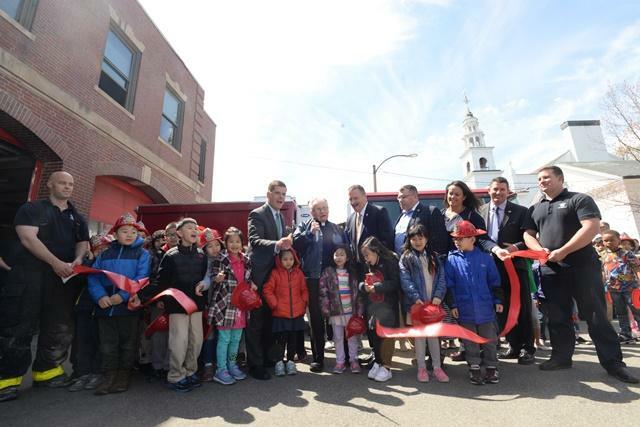 The replacements of Engines 42 in Egleston Square and Engine 17 in Dorchester, the location of today's event, will be among the first firehouses in the nation to reflect these enhancements, at a combined cost of nearly $40 million. In Charlestown, Engine 50 will undergo a complete building renovation totaling $3.8 million for exterior masonry work, upgrades to building systems and widening of apparatus doors. In addition, in an effort to promote health and safety for firefighters, the Mayor's proposed FY18 operating budget will include $500,000 for a pilot program to provide industrial level cleaning for firehouses. The funds will pay to thoroughly clean ductwork, replace ceilings where necessary, and replace fabric furniture that has become contaminated with potentially carcinogenic compounds. Other investments will support the infrastructure and equipment utilized by Boston's firefighters, and will include roof and masonry construction at firehouses for Engine 4, 5, 14 and 55, as well as HVAC and lighting upgrades at various fire stations to improve energy efficiency and utilize utility rebates. Boston's commitment to firefighters has also been recognized nationally. Last month, the Metro Fire Chiefs Association named Commissioner Finn National Fire Chief of the Year. Commissioner Finn was selected for his leadership in working to improve the health, wellness, safety and protective gear for firefighters. In addition to establishing a Safety, Health & Wellness Division with the Boston Fire Department, Commissioner Finn has also implemented safety measures including new 45 minute air tanks, wearing of hoods at fire scenes, putting bunker gear washing machine extractors in firehouses and monitoring of air quality in fire buildings. "It's an honor to be named National Fire Chief of the Year, and be able to lead Boston's dedicated firemen and women," said Commissioner Finn. "Mayor Walsh and Boston's commitment to the fire service is unmatched across the country, and is one of the factors in keeping fatal fires in Boston to one of the lowest levels anywhere. This day recognizes the trust and support my department receives, and makes me proud to serve my City."